Dress your child in loose, comfortable clothing. No one can relax while constantly tugging at a tight sweater or bunching pants, especially on a cramped airplane, so make comfort the style for your child. Slip-on or Velcro shoes are a comfy, practical way to make security checks less of a headache. And think layers: changing temperatures from airport to plane can be dramatic, so make sure your child can bundle up and cool down as needed. Let them have their own piece of luggage. Whether it’s a suitcase or a light carry-on bag, let your child be more involved in the travel process by putting them in charge of their own luggage. A kid-friendly option is a small roller with four wheel spinners so your child can push or pull their bag as needed. It’s a great way to give them a sense of responsibility and something to focus on amidst the chaos of the airport. Just be sure to keep an eye on both child and bag so no one or thing gets lost! Pack plenty of snacks and drinks. The selection of refreshments at the airport and on the plane can be both limited and expensive, so pack your own. Multigrain crackers, dried fruit, granola bars and trail mix are all easy and healthy options. Juice boxes are easily packed but if you prefer your child stick to water, bring empty lidded cups or water bottles to fill. It’s also a good idea to pack gum to help ease the discomfort of rising and falling cabin pressure. Bring a bottle or pacifier if traveling with an infant. One of the major reasons babies cry on airplanes is due to ear pain caused by fluctuations in cabin pressure. It can be especially painful if she has a stuffy nose. Give her a bottle or pacifier during takeoff and landing to help relieve the pressure. Discuss security procedures with toddlers ahead of time. Though you may be a seasoned traveler, your child is unfamiliar with security rules and protocol. Have a conversation with him before heading to the airport about what happens at security check. Tell him about the neat X-ray machine his bag and stuffed animal will go through, making sure he knows he’ll get them back quickly and without harm. And those super cool Star Wars-themed sneakers he’s wearing? The security team just has to see them up close! Make it as exciting as possible, while retaining the idea that it isn’t a time to play. Be active before your flight. Since you’re probably at the airport early anyway, use your extra time to wander around a bit. Help her burn off excess energy by going on an airport scavenger hunt together (items might include a purple suitcase, a dog/other animal carrier, an airline pilot, etc). Keep her busy until it’s nearly time to board. Best case scenario, she sleeps through the majority of the flight; worst case, she’ll get to explore a new place. 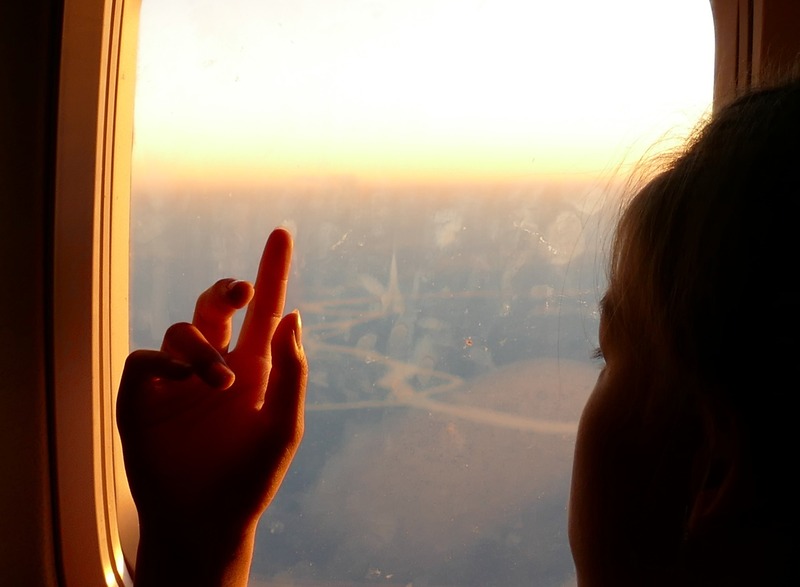 Your child’s first experience on an airplane could be the adventure they’ve been waiting for. Keep these tips in mind when the time comes, and you can journey through the skies with ease!